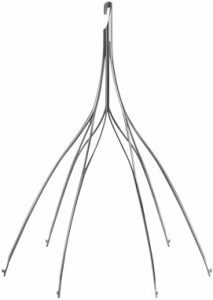 IVC filters are metal devices implanted through a small catheter from a peripheral vein into the inferior vena cava (IVC). The IVC is the main vein in the abdomen that receives blood from all the veins in the pelvis and legs. Blood clot in the legs can travel through the IVC and into the lungs to cause potentially fatal pulmonary embolism. The IVC filter is placed to help prevent pulmonary embolism in the lungs in high-risk patients. The standard treatment for active blood clots in veins is blood thinners such as coumadin and lovenox. 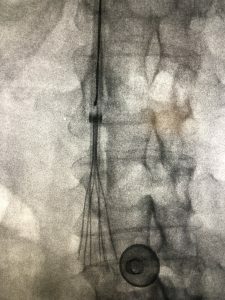 Indications for IVC filter placement include contraindication to blood thinner in a patient with active blood clots in their veins, recurrent pulmonary embolism (PE) or progression of clot while on blood thinner, and complication of blood thinner. Filters should only be placed if there is a true medical indication. Even though they can prevent life threatening pulmonary embolism, filters can cause problems the longer they are left in place. There are long-term risks of filter migration, filter fracture, and IVC occlusion. The occurrence of these risks is low but not exactly known. Therefore, if patients no longer need the filter for clot protection, they should have the filter removed. The filter is removed through a procedure very similar to the placement. A small catheter is inserted into a vein in the neck, and the filter is removed using a snare loop or forceps and pulled back through the catheter out of the body. A band-aid is placed at the catheter insertion site and most patients go home the same day. The risk of injury to the IVC during removal is relatively low. The longer a filter remains in the IVC, the more difficult it is to remove. Therefore, it is extremely important to make an appointment with an interventional radiologist for removal if the filter is no longer needed. With today’s advanced techniques, almost all filters can be removed no matter how long they have been in place.